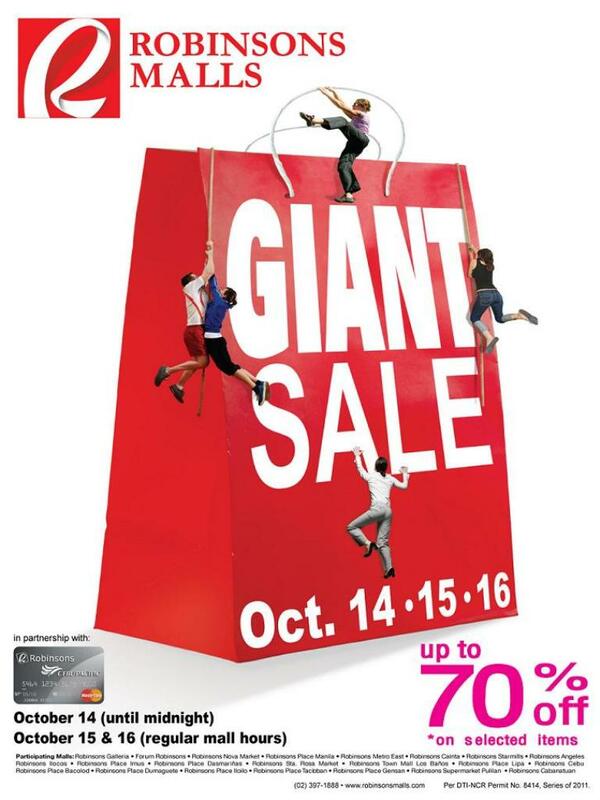 Home / 2011 / giant sale / mall / robinsons galleria / robinsons malls / robinsons midtown / robinsons place manila / sale / shopping / weekend / Robinsons Giant Sale, Hear I Come! 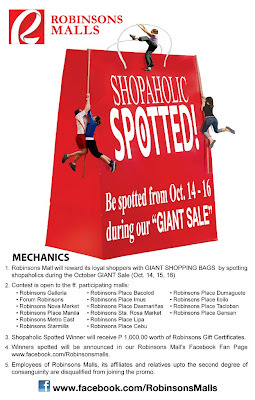 Robinsons Giant Sale, Hear I Come! Who says I didn't feel the wrath of Typhoon Pedring and Quiel? Well, if you'll just take a look at my shoes, you'll know that this fashionista-wannabe needs some new shoe-love! And when I say shoe-love, I need lots of them! And thank God, there's a sale coming up this weekend, the Robinsons Giant Sale! Wee! Those typhoons brought a lot of rain and left a lot of damages, including my shoes, and since we are still on rainy season, it is important to spend wisely. So this weekend's Robinsons Giant Sale is the best answer to my budgeted salary this coming payday. 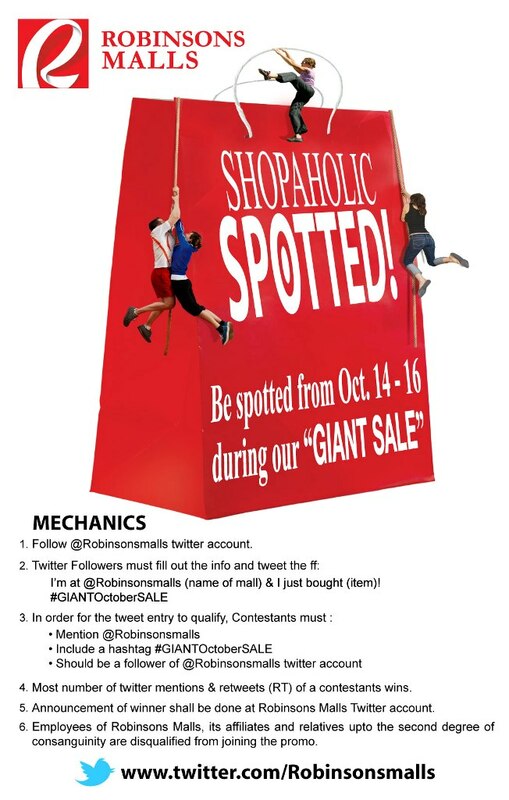 For those who didn't know yet, on this coming October 14, 15 and 16, Robinsons Malls are having the Giant Big Sale that can give us 70% discount on selected items! 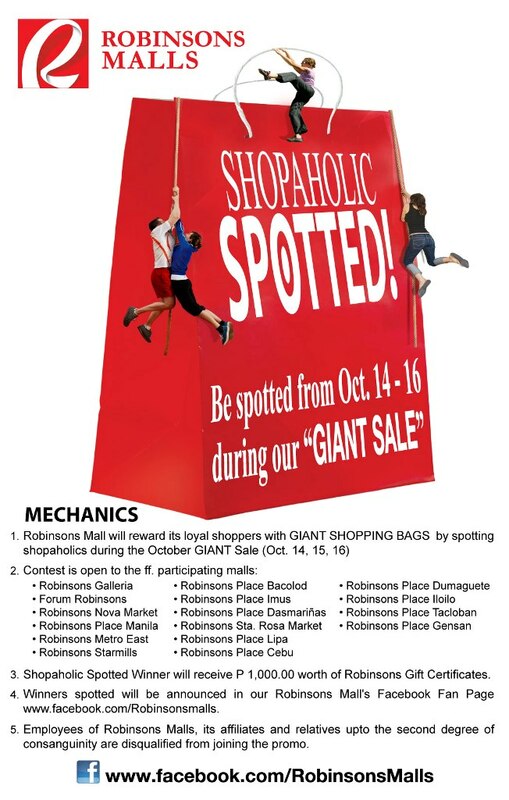 This Giant Big Sale will be happening at Robinsons Galleria, Forum Robinson, Robinsons Nova Market, Robinsons Place Manila, Robinsons Metro East, Robinsons Cainta, Robinsons Starmills, Robinsons Angeles, Robinsons Ilocos, Robinsons Place Imus, Robinsons Place Dasmariñas, Robinsons Sta. Rosa Market, Robinsons Town Mall Los Baños, Robinsons Place Lipa, Robinsons Cebu, Robinsons Place Bacolod, Robinsons Place Dumaguete, Robinsons Place Iloilo, Robinsons Place Tacloban, Robinsons Place Gensan, Robinsons Supermarket Pulilan and Robinsons Catanduanes. As for those people who are into Facebook and Twitter, like me, Robinsons prepared something extra for us - something that we will surely enjoy. Just check out the poster below for more details. Well, I guess, all I can say is SEE YOU THERE! I am still thinking where to go, Robinsons Galleria or Robinsons Place Manila, but one thing is for sure, I'll be at Robinsons Mall this coming weekend and I'll be Tweeting and Facebooking about it. Hehehe. I badly need a new kicks.